We just did it - switching from Maxis to DiGi. The reason: Poor mobile broadband services. Maxis broadband is very good - and speedy - in the city area, especially where LTE (4G) service is available. 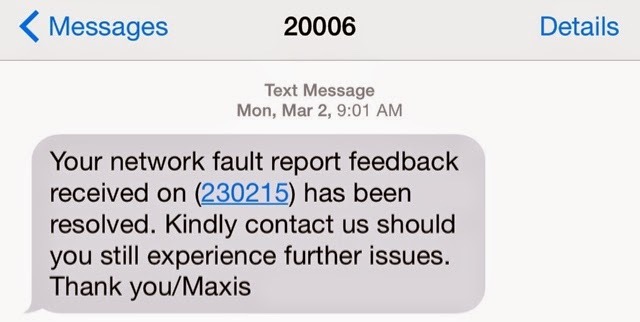 But in our particular case, Maxis broadband quality has gone from good to bad. This is true for all of our areas of interest -- Kolopis & Inobong areas in Penampang and Ketiau area in Putatan. This is their reply after more than a week from the date of complaint, but the 3G issues remain. I currently subscribe to Celcom, DiGi and still have 1 non-contract subscription with Maxis SurfMore75 which I'm contemplating of getting rid of. Analyst firm Frost & Sullivan said that 83% of Malaysian consumers will be driven to switch telco providers if there is a lack of transparency in Malaysian pricing and subscription plans. According to an online survey conducted from October to November 2014 of 1,300 respondents, randomly selected from consumer online panels in Malaysia, 66% of respondents surveyed also demand for higher speed connectivity and they have no qualms ending their subscription from the current service provider due to low speed. The lack of customer experience from telecom service providers is the fourth highest reason at 58% for Malaysians to stop their subscription. Based on data, Celcom is ahead of the industry average (57%) at 66% in terms of customer loyalty. When asked if they would recommend their current telecommunication service provider to their friends and colleagues, U Mobile is the clear winner with 65%, which is higher than the industry average of 51%. Malaysian telecommunication service providers' customer rewards program leave much to be desired. More than one-third of the consumers reported not receiving any rewards from their service providers, and even among those who did, almost half get a celebratory token on their special days, which could be considered a bare minimum by the consumers. Below are the Malaysian telecommunication service providers that have been recognised in Excellence in Customer Experience Management, Telecommunications Industry by their customers based on a survey conducted by Frost & Sullivan. My Maxis mobile internet speed went super slow (despite H or H+ shown on screen) 2 weeks ago. My RM30 worth of data subscription went down the drain unused because of this. Thank goodness its just a prepaid simcard. Thanks for droping by, Rungitom. I have a 5GB Maxis mobile internet subscription and for the last couple of months didnt get to fully utilise them for the same reason. Looks like U Mobile is a worthy competitor. It's a pity their coverage in Sabah is limited.